Gerald McBoing Boing is the story of 6-year-old Gerald: an adventurous little boy with a unique talent for speaking only in sound effects. This game offers young children the chance to join Gerald as he honks, whistles, clangs, toots and cuckoos through his day. 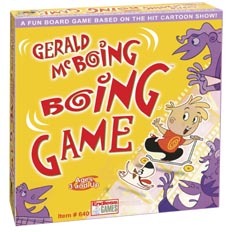 Based on the Acadamy Award-winning Dr. Seuss character now featured every day on the Cartoon Network, the Gerald McBoing Boing Game will entertain as it teaches, using sound association to engage and involve its young players.